A double replacement reaction takes place when two ionized compounds exchange ions to produce two new substances. The reacting substances dissociate in a water solution, and the positive or negative ions change places. The resulting new substances either stay in solution, escape as gas, or precipitate out as an insoluble reaction product. Double replacement reactions can take many forms including several types of acid-base reactions. The rules of solubility help predict which substances can take part in double replacement reactions and which reaction products will precipitate out of solution. A double replacement reaction is a precipitation or acid-base reaction in which the reactants ionize and either the positive or negative ions exchange places to produce two new substances. Precipitation reactions produce one substance that is insoluble while acid-base reactions can produce soluble, liquid or gaseous reaction products. The details of how a double replacement reaction works can be seen with the example of hypothetical compounds AB and CD. These are compounds where atoms A and C have formed bonds with atoms B and D respectively. When placed in solution, they dissociate into positively charged ions A+ and C+ together with negatively charged ions B- and D-. The two positively charged ions repel each other due to their similar charges, as do the two negatively charged ions. That leaves AD and CB as the potential double replacement chemical reaction, with the B and D ions changing places. The new compounds can be an insoluble solid, a soluble solid, a liquid or a gas. Depending on the details of the reaction, the kind of substance that is produced shows whether a reaction has taken place. If a substance does not dissolve in water, it can't take part in a double replacement reaction. The following solubility rules help predict which substances will react in solution. Salts of alkali metal ions such as lithium, sodium and potassium are soluble. Ammonium ion salts are soluble. Most bromide, iodide and chloride salts are soluble, except the salts of silver, mercury and lead. Most sulfate salts are soluble, except the salts of calcium, mercury, lead and barium. Most hydroxide salts are insoluble, except salts of calcium, barium and strontium. Most sulfides, carbonates, phosphates and chromates are insoluble except those of the alkali metals and ammonium. Typical precipitation reactions introduce two soluble substances into a water solution producing an insoluble solid. For example, zinc nitrate and sodium phosphate react in a double replacement reaction. 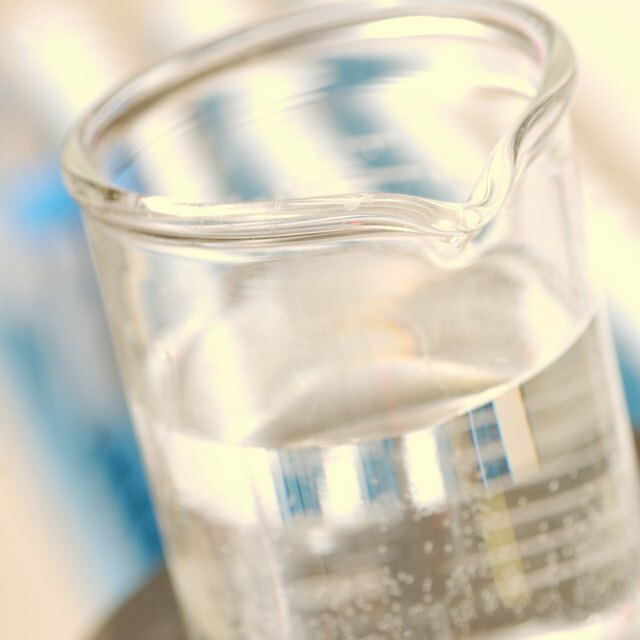 Zinc nitrate is soluble in water because it is a nitrate salt and, although phosphates are mostly insoluble, sodium is an alkali metal, and therefore sodium phosphate is soluble. The two substances exchange ions to become sodium nitrate, which remains in solution, and zinc phosphate, which is insoluble and precipitates out. Acids and bases ionize in solution to form hydrogen and hydroxide ions. In a double replacement reaction, the hydrogen ion from the acid joins with the hydroxide ion of the base to form water, one of the double replacement reaction products. The other products are formed from the remaining ions introduced into the reaction. A simple acid-base reaction such as hydrochloric acid (HCl) and sodium hydroxide (NaOH) yields a salt (NaCl) and water. A more complex reaction dissolves sodium carbonate (Na2CO3) in a water solution of HCl. The resulting double replacement reaction yields NaCl and CO2 as well as water. The key features of double replacement reactions are the solubility of the two reactants, their ionization in solution, and the evidence of the resulting chemical reaction. If a precipitate or a gas forms, a chemical reaction has taken place, but for some acid-base reactions, the product can be liquid or a soluble salt. In such cases, additional tests may be required for evidence of a reaction. Markgraf, Bert. "What is a Double Replacement Reaction?" Sciencing, https://sciencing.com/what-is-a-double-replacement-reaction-13710476.html. 19 March 2018.